Bulgaria's capital Sofia is facing a crisis situation because of the pouring rain over the last two days, Mayor Yordanka Fandakova declared. Several streets and roads in the Sofia suburbs have already been closed as they have been flooded by the rain. The Traffic Police Department urged people to go out with their cars only in absolute emergencies. The greatest problem within the city stems from condition of the several tiny rivers flowing through it; usually, they have very little water, and as a result their beds have not been cleaned regularly. As the beds are now filling with much more water, this is a potential flooding hazard. Part of the Sofia Beltway has also been closed making the traffic around the capital harder than usual. A number of the villages around Sofia might have to be evacuated as the authorities are considering increasing the outflow from the water reservoirs in the area to prevent any danger of the dams breaking. The torrential rains have also affected the city of Pernik, 30 southwest of Sofia, where the major inner-city road has been flooded. 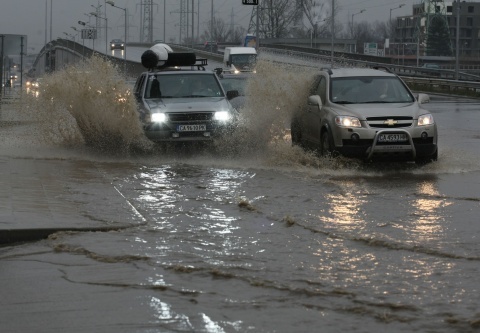 The torrential rains in the Sofia region have continued for more than two days.